Is your business on Twitter? It should be. 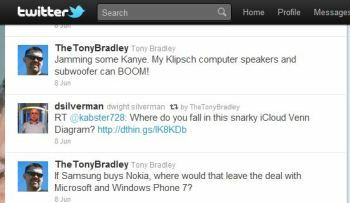 The microblogging site has tweeted its way, 140 characters at a time, to the top of the social media ladder. With more than 200 million members sending out an estimated 65 million tweets per day, your business should be engaged. But hold on. If you haven't learned yet from using Facebook or other social networks, establishing relationships with customers via such platforms is not the same as just marketing to them. You need to understand both the unique aspects of Twitter and how to use it effectively to communicate with your customers in order to be successful. If you're Ashton Kutcher, Charlie Sheen, or Lady Gaga, just show up, and millions will follow you instantly. If you are not a megastar, though--and most of us aren't--you will have to put a little more effort into it. Start by inviting any existing customer communities you might have. TweetDeck is a powerful tool for Twitter that helps you organize and schedule tweets.Does your company have a Website, blog, customer e-mail distribution list, or a product newsletter? Use all means at your disposal. If your customers have a Twitter account, invite them to follow you. You should also include the Twitter icon with a link to your Twitter account in your e-mail signature, marketing collateral, or anything else that might get exposure. You can even provide incentives for anyone who follows you, such as the chance to win a free product or service, or a discount. Part of the culture of Twitter is that users generally follow back those who follow them. Click on Twitter's own "Who to Follow" link for suggestions. 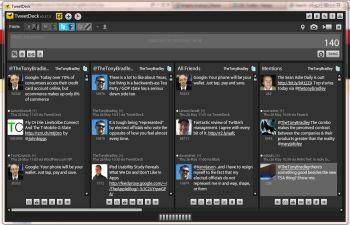 A tool like Tweet Adder software can provide even more detail. Use it to search for Twitter users who already follow similar companies, or who express an interest in your topic or industry, and then automatically follow those users. Some portion of them are likely to follow your Twitter account. First, of course, make your Twitter page attractive with a compelling profile image, background, and "About" description. If you're a newbie, get to know the basic Twitter best practices, such as direct messaging, "@" replies, and "retweeting." You can send a private message directly to someone who follows you by typing the letter "d" in front of their username in a tweet. In your public tweets, use "@" replies to comment on any other user's tweets; just include the "@" symbol before their username in your message. If you want to repeat what someone else tweeted, choose "Retweet" and include the letters "RT" in the beginning of your note. You can even ask politely in a tweet for others to retweet you. These practices draw attention to fellow users, who in turn can see that you're noticing them. To use them well, add your own insight in a retweet rather than simply repeating what someone else said. And check when others call out your tweets, so you can keep the conversation flowing. Once you have the hang of the basics, tools such as GroupTweet enable you to communicate with groups of users, even privately. One of the biggest mistakes companies make with Twitter--and social media in general--is trying to use it for old-fashioned marketing. The sound bite or slogan that you plaster on a highway billboard or in a magazine ad may come across as false on Twitter. Tweets should include original thoughts and build a conversation that engages other users by using tactics such as "retweeting. "Twitter can be an effective marketing tool, but social media is about engaging in conversationand providing value. You market by who you are, not by what you say. You can certainly use Twitter as a medium for announcing new products or features, but your tweets have to provide more value to keep your audience interested. Share relevant news about your industry in general, as well as helpful tips and advice, and some general conversation to give your followers a reason to stay engaged and participate in the discussion. Make your tweets entertaining and witty, and say something unique. Position yourself as an expert in your field and offer free advice. It's better to extend your personality and opinion than merely to parrot headlines from news stories. Make sure that you're not spending most of your 140-character allowance on a long Web address. URL-shortening services like Bit.ly or TinyURL can abbreviate such lengthy strings. Bit.ly provides additional value by gathering valuable metrics you can use to monitor the success of your Twitter efforts. You can examine how many clicks your shortened links get, and where in the world your URL is getting the most action--information you can use to figure out what works best. You can make tweets more interactive by connecting them with polls, using a service likeTwtpoll, or with chat rooms, using Nurph. Your followers will find more value in paying attention to your tweets if they find interesting conversations to participate in. And integrating Twitter with location-based services such as Foursquare can call attention, for instance, to that conference you're speaking at in Atlanta, and maybe someone nearby in your field will notice. Tweetdeck--which was recently acquired by Twitter--lets you view and manage multiple Twitter accounts, as well as Facebook, LinkedIn, MySpace, Google Buzz, and Foursquare accounts. You can create lists and filter content to cut through the noise, and use Tweetdeck to post updates to the various connected networks. Columns in Tweetdeck let you monitor specific keywords or hash tags. You can also set up a column in Tweetdeck to monitor when other Twitter accounts mention your company, providing you with an opportunity to recognize loyal customers, identify possible public-relations issues, and put out fires quickly. 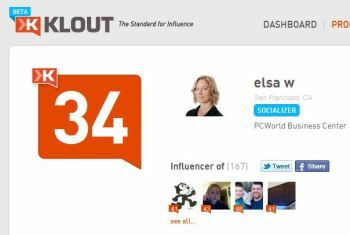 Klout attempts to give your influence a numeric score. Hey, we can't all be Lady Gaga.Tweetdeck lets you schedule tweets to post in advance, but Flowtown's Timely goes a step further. It analyzes your past tweets to estimate what time of day favored them the most. Then, it autoschedules your future tweets accordingly. One way to attract attention is to tweet about a topic while it's popular. Set up a Google Alert to track the topics in your field, and when it sends a hot story to your e-mail inbox, tweet about it. If your company fixes old PCS, and a report about electronics waste is making headlines, you could include the hashtag #ewaste in a tweet explaining how your work keeps tech out of landfills. Even if you're not commenting on one of the top news stories of the day, you can tie your tweets to upcoming events in your area. For example, if your business bakes seasonal organic pies, you could include hash tags like #localfood and #farmersmarket to announce that you'll be at next Sunday's farmers market. NearbyTweets lets you view who's talking about nearly any topic in a specific part of the world, such as real estate in Chicago. We already talked about not using Twitter as a bullhorn for spamming followers with marketing sound bites. But watch out for other pitfalls. For one thing, remember that many "followers" aren't actually paying attention. While the tactic of following like-minded Twitter accounts in the hope of soliciting a reciprocal follow has merit, it only goes so far. Many of the users who follow back are just using that same tactic to pump up their own following, and aren't really interested in your tweets or your business. Need I remind you that you are not Lady Gaga? You won't instantly have millions of followers. There won't be a miraculous spike in sales or profit for your company just because you set up a Twitter account. As with anything worth doing, there is no magic shortcut.